Ok … christmas. How was it? I tell you about mine and would love to hear your stories too! 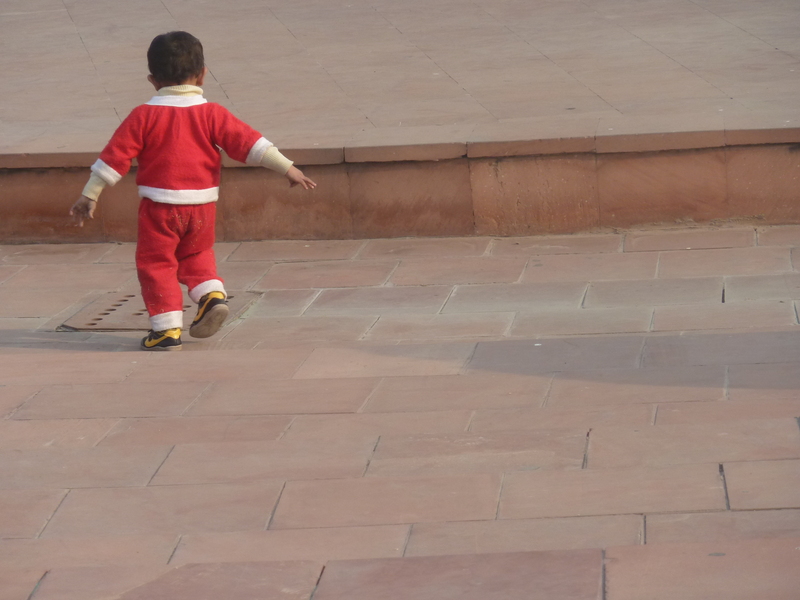 I spent christmas in Delhi where I arrived on the 25th in the morning. My train arrived on schedule which was a little miracle as it is fog season and therefore trains are never on time. Well, except the one I took. Despite the ice cold night I felt much better in the morning. I also had a good night sleep in my sleeper train No 22 (upper bed). As usual I get off the train and look for a little place to drink a chai. After I land somewhere it is always much more relaxing to sit and sip tea instead of heading immediately to a guesthouse or hotel and get ripped of by the swarm of rikscha drivers. The place I entered this time made the best Paratha I had eaten so far in india. I was happy that I already had booked a hotel. After my great breakfast and my almost gained back health I just paid the ridiculous rikscha price and slept until the afternoon in my nice hotel room. When I woke up I decided to go to the nearest park to celebrate christmas. The park was packed with people and it was very obvious that something is changing in india as I saw unmarried couples kissing and hugging each other! 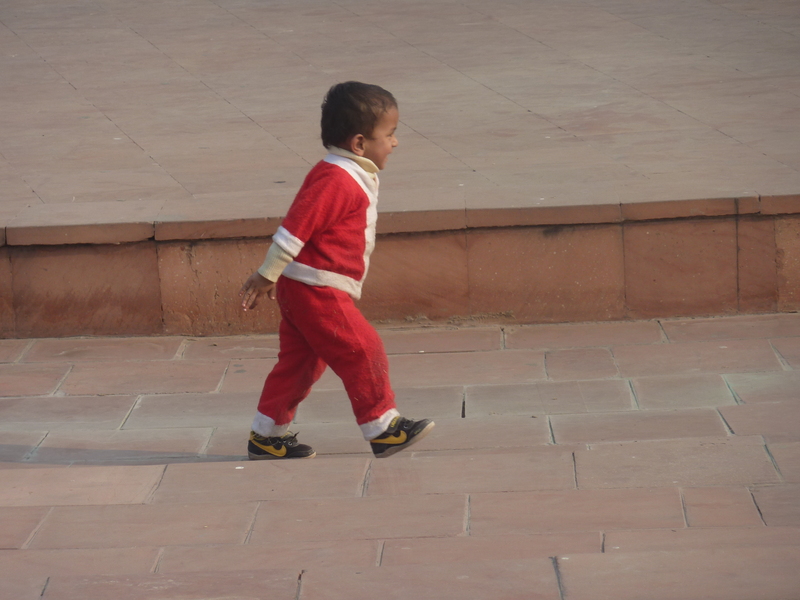 But I mostly observed children and they mostly observed me and I finally discovered THE indian Santa Claus. But honestly the time in the park was pretty depressing and I went on the search for a real coffee place. In my coffee journey I got absorbed in the busy Delhi shopping rave! Perceived thousands of people were in the shopping malls and also in the underground shopping madness. When you want to enter the shopping inferno you get searched by securities. It took me a long time until I found the posh Lavazza place. Unbelievably I bumped into Varanasi Claas who had coffee with a girl called Caroline. I wished to see him again as we did not exchange our addresses but I really did not expect to see him in a coffee shop in the 11 million people metropolis Delhi! He told us women about his sweet love liaison with a lovely serbian girl in Varanasi. And he is right his girl is a really wonderful young woman. For him the love story seemed to has finished in Varanasi and he also seemed to be quite clear about that. Caroline suddenly asked him very seriously :” Claas, have you been honest with this girl and did you tell her your true feelings?” Claas nodded as Caroline went on for quite awhile about being honest with lovers. Energetically she spilled her own pain and suffering about her sad experiences with guys on the table. I could feel her in me and I agree with her opinion. I vote for honesty too. With her statements she opened space for deep and intimate themes between us. Themes you either discuss with your friends of with strangers you might never see again. Light-footed Claas, who can be also very profound convinced me to go shopping with him. He just had bought 9! jeans together with Caroline. And as it was Christmas I thought why not buying me a cool levis I definitely need anyway! The vendors in the store were a little bit irritated to see Claas again and also with a different woman, but he just made a joke about it and told them that the next day he will be back with one more woman. We three decided to have a christmas dinner together and it has been really cool to dress up a little. We were all wearing our new jeans and a Rikscha brought us to a nice area in Delhi. Caroline was our guide that evening as she was living almost for a year in Delhi. I found out that even I thought I made always a good Rikscha price it was still way more than the “original” good price. Our dinner was very spicy. At least the surmai fish in coconut gravy. Claas’ strategy was to scratch the gravy from the fish to make it eatable. But beside the food disappointment we had a great evening together. The night was carrying us through a lot of personal insights we shared with each other, respect, trust AND fun. We also made a contribution to reconcile the Netherlands, Germany and France on the behalf of the 2nd world war. Especially as Caroline told us about her jewish origin and all the terrible stories about germans she grew up with. Once again I understood why travelling and honestly connecting with people from other countries can bring happiness and acceptance among people and in this world. I think we all 3 could feel that vibe of understanding. Back in the hotel I had 20min to pack before my taxi came to pick me up for the airport. Down in the lobby Claas and I cuddled for a second and kissed each other good-bye. We know that we will meet again. Whenever that will be and in whatever circumstances we will be in. An unexpected christmas bliss at the end to my intense trip! I love india and its instant wish-fulfilment potential! This entry was tagged 2nd world war, Christmas, Goodbye, Honesty, little miracle, Paratha, shopping. Bookmark the permalink.